February 18, Monday, 7:00 p.m. at the Butterfly House in Faust Park! The Seed-Dispersing Services of Ants"
Eva is a Ph.D. student with Dr. Robert Marquis’s lab at the University of Missouri at St. Louis, where she is studying the effect of fire on ant-dispersed forest herbs. March 18, Monday, 7:00 p.m. at the Butterfly House in Faust Park! "The secret world of Daddy Long Legs"
The Opiliones move silently while often misunderstood throughout the world as "the most venomous spider"; but did you know they are not spiders nor venomous?! Letty is a Ph.D. student in Kasey Fowler-Finn’s lab at St. Louis University, where she is studying predator-prey behaviors in arachnids. Cece is an undergraduate in the Fowler-Finn lab studying gut parasites in daddy long legs. Join WGNSS for birds, botany, & entomology! All are welcome. All events are free & open to the public, unless noted. ​​WGNSS Entomology programs are held on the 3rd Monday of each month at the Sophia M. Sachs Butterfly House in Faust Park, Chesterfield MO from September thru May, at 7:00 PM. For more information contact Chris Brown. Learn More about Insects and Entomology at these Nature Websites! Beetles in the Bush. Ted MacRae is a Research Entomologist, and Beetle Taxonomist, Editor of the The Pan-Pacific Entomologist, Layout Editor for the journal Cicindela, and Editor of WGNSS Nature Notes. Ted has one of the top insect nature blogs on the internet, with lively infomative discussions and amazing photos. Beneficial Pollinators. The St. Louis Zoo is helping insect pollinators! Learn about beneficial insect pollinators, how to identify them, and how you can help pollinators too! BugGuide. Is an online community of naturalists who enjoy learning about and sharing our observations of insects, spiders, and other related creatures! Bug Squad. Happenings in the Insect World. Kathy Keatley Garvey is a communications specialist with the Department of Entomology and Nematology at UC Davis. Her blog is part of the University of California's Agricultural and Natural Resources website. Butterflies and Moths of North America. "Butterflies and Moths of North America (BAMONA) is an ambitious effort to collect, store, and share species information and occurrence data. You can participate by taking and submitting photographs of butterflies, moths, and caterpillars." Dunlap Cognitive Ecology. Dr. Aimee Sue Dunlap is a Ecology and Evolution Research Entomologist studying cognitive ecology within the Biology Department at the University of Missouri- St. Louis. Her lab is also affiliated with the Harris World Ecology Center and the Center for Neurodynamics. Ozark Bill. An Illuminating and educational nature blog featuring the incredible nature and wildlife photography of Bill Duncan. 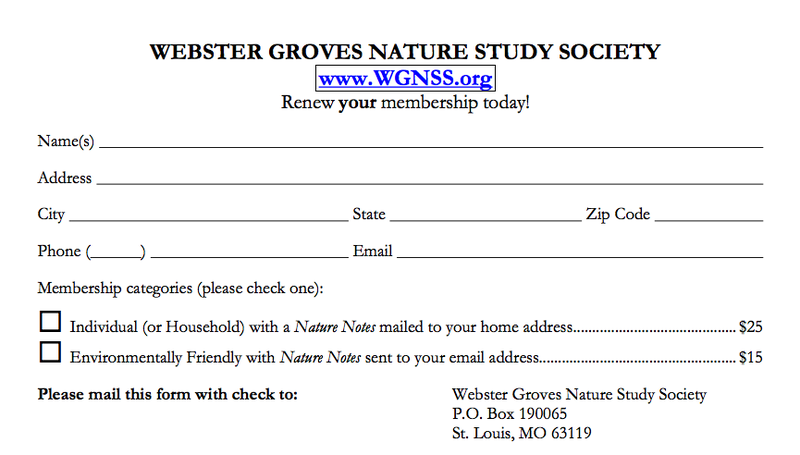 Contact WGNSS WebsIte Coordinator, Mark Paradise, to have your Nature Blog listed here. December 20 – “Vibrational signaling in treehoppers and other singing insects” Dr. Kasey Fowler-Finn. April 17 – St. Louis County Department of Health, Vector Control will present on what his organization does regarding insects of medical importance in St. Louis Countym, Jim Sayer of St. Louis County Department of Health.